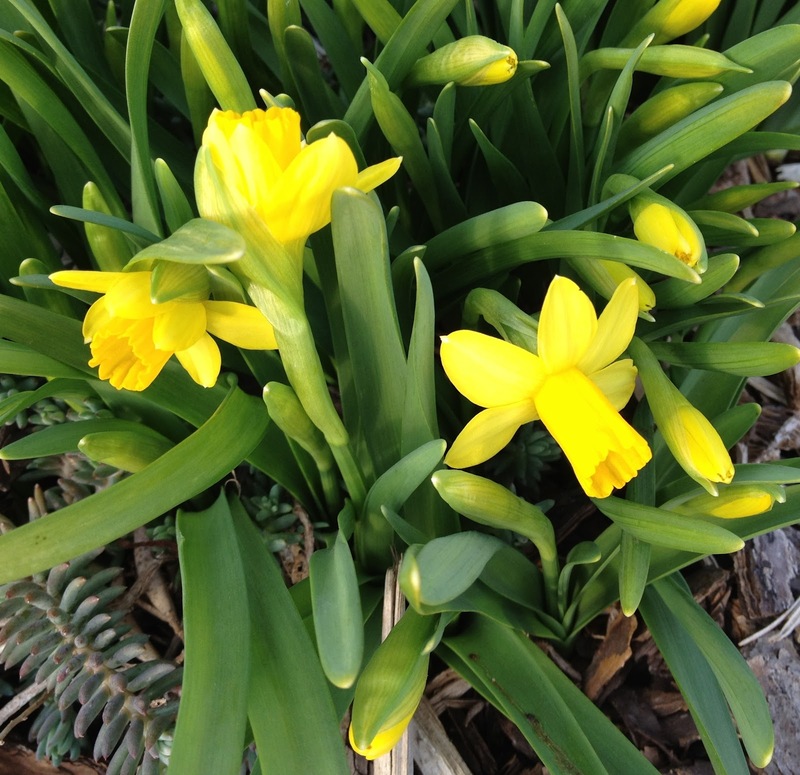 How else does one describe the thoughts of a gardener on the first warm day of spring? How does one explain the furtive glances out the window, the longing to go out and do something, anything, in the garden? How does one explain the head turning and walking through the garden, the gardener nearly running from one bloom to another? How can irises be fading already? Where have the snow drops gone? And crocuses? Where did these new blooms come from? And miniature daffodils? Already? How can it all be happening so quickly? Garden fairies here. Whoa, we are garden fairies and we saw quite a sight this afternoon. We were minding our own business, which is what we always do, rumors and whispers to the contrary not withstanding, when here comes Carol. And what does she have? Three flats of pansies, that's what she has. Pretty ones, too. All white and purple and lilac colored. None of those faceless pansies, either. We don't like those. They are soulless. We like our pansies to have faces. Though, like Carol, we don't like other things to have faces in the garden, other than flowers. Whoa, we are garden fairies and we got off track a bit. Sorry about that, we are garden fairies. Anyway, the next thing we know, Carol has hauled out the wheelbarrow, some bags of potting mix and the containers that she only uses for pansies. We were so excited! Yet a bit afraid. We ran for cover but were close enough so we could see the dirt a-flying and the pansies a-flinging. Next thing we know, Carol has containers all planted up and the window box, too, all full of pansies. Yeah. We are garden fairies, we love this day every spring, though this spring it seems a little earlier than usual. Hey, we are garden fairies, we checked and she did plant earlier, by about a week. Carol sure can move fast. We are garden fairies, we'll have to keep that in mind. For our own safety, mind you, because we wouldn't want to accidentally be seen or worse -- stepped on. Shudder at the thought. We are garden fairies. We can only describe what we witnessed as madness out there late this afternoon until nearly dusk. But really, it was a good kind of madness. It was the kind of madness that ends with a front porch transformed from later winter to early spring with the addition of a few pansies, the kind of madness that we garden fairies can appreciate. All of us at May Dreams Gardens are pleased that this blog has been included as a reader's choice finalist for About.com's Best Garden Blog. You can vote once every 24 hours until March 21st with any valid email address. We (the garden fairies and I) appreciate your votes, if you are so inclined to vote. Click on the link to do so. Thank you! I planted containers of pansies today, too, for a client. Ours were faceless but very fragrant, Delta Pure Deep Orange, to go with the orange-red doors. The orange pansies help brighten this client's porch, which is borderline dark. I like the faces, too, but I couldn't find any Delta Deep Orange Blotch. I like pansies, but I like violas better. Hi Carol and Garden Fairies! Spring fever, that's what it is! It is a most wonderful thing to witness each year. Stuff is happening fast and furious here as well. Hope you all don't get stepped upon! It's mostly too late for pansies of any kind here. But I love your choices. Such lucky fairies! I just bought a couple of pansies to put in one of my patio containers, and while the new very large fancy faced violets with sunset colors on cream were very tempting, I was afraid they would be too delicate for a windy spot and I went for the fragrance, a deep purple with black eye, Blue Blotch, and smaller deep magenta one with a bluer eye, Purple Rain. They smell divine. I brought home 'Etain' violas last week, such pretty little flowers and I have hopes they will last through the Spring.